"I’m a weekend warrior beach volleyball player, HIIT participant, and have a job that requires long hours of standing. As a consequence I’ve suffered from decades of chronic plantar fasciitis. All traditional therapies including many sets of custom orthotics, countless cortisone injections, and a round of PRP have provided short-lived and/or minimal benefit. While rehabbing from patellar tendon debridement after the last cortisone shot to my right heel I commented to my PT that I had had it and wanted a referral for surgery. His reply was “before you do that you need to see Abby”. Abby undertook the most thorough diagnostic assessment I’ve ever had, stated: “give me 6 months”, and set a treatment plan. She did it! I am orthotic and night splint free. I’ve had dramatic improvement in pain reduction, foot strength, and balance. Perhaps most importantly when pain does flare from overdoing it she has educated and equipped me to manage it on my own." Thanks Abby!" " I am a local physician who wants to remain very active. Somewhere along the way my shoulders and back became problematic for me, and my ortho doctor referred me to Run Raleigh for physical therapy to avoid surgical intervention. Brian's healing hands have relieved my discomfort and kept me functional for work and after hours! My encounters have all been super efficient, convenient, and economical. 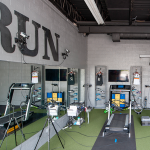 I have no reservations in recommending the team at Run Raleigh." "I had been injured off and on for ten years and seriously considered giving up running. Gave Run Raleigh and Carol an almost last ditch effort and boy did it pay off. Carol has been amazing. Dry needling has been so helpful. Would recommend to anyone!" 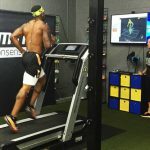 "In 2013, with a torn meniscus, and a severe ankle injury soon thereafter, I sought a sports specific physical therapist who could get me back on the soccer field as soon as possible. With Abby's care I was able to recover fully, and get back to pursuing my dream of becoming a professional soccer player. She truly has a gift in healing. Through exercise guidance, innovative modalities, and a keen awareness of body mechanics, I experienced a speedy recovery and felt stronger than I had ever felt previously. I would recommend Abby to anyone." "I have had chronic tension in my right neck, shoulder and hip for many years. I always dreamed that I could find someone to get deeply into my muscles and help adjust the muscles that were “unreachable” and stubborn. When I found Kari Smith and dry needling, I was delighted that I had found just such therapy. Since I started dry needling with Kari, improvement has been steady and constant. Kari’s expertise and methods are helping me strengthen and re-train muscles that have been pushing and pulling me around for far too long." "I want to say how thankful that I am for all the work Run Raleigh has done to keep me going. 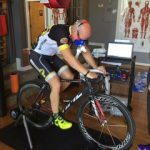 I have tried all types of treatment throughout my 8 years of the crazy sport of triathlon. I have had many acupuncture treatments, deep tissue massage treatments and months of agonizing pain while training and racing. What Kari and Abby have been able to do for me during this year so far has been awesome. It actually has given me the ability to train as hard as I need to and know without a shadow of a doubt that you will get be back out there the next day. The dry needling therapy has replaced all other types of therapy for me. It has also given me the confidence to shred all of the compression gear I thought I needed while training and made my body respond better. In February when I slightly tore my calf again I thought my racing year was over. With their help I have not only completed Ironman Raleigh 70.3 in June but I am 6 weeks away from Ironman Louisville. I thank you both for everything and truly believe without Run Raleigh I would not be in the shape I am in!!!!" "Claire is just hands down amazing. I started seeing her because of constant tightness and pain in my neck. I no longer experience the excruciating pain I used to and we continue to maintain that area where stress always creeps up. I then tore my ACL and she helped me to recover quickly from the surgery. I continue to see Claire for maintenance for my whole body. She is able to quickly pinpoint and alleviate any issues I have...far quicker than any massage I've ever had. I highly recommend her and do so on a regular basis to anyone I come across." "Claire’s ability to quickly pinpoint issues, work on them, and develop a plan to prevent them from happening again make her a phenomenal PT. I can fit her easy to follow programs into my life and they aren’t a burden. I’d be lost without her! (This almost makes me sound like a healthy person – ha ha!) By using dry needling, Claire was able to decrease my crippling ice pick headaches. (That is actually the clinical term for them – I kid you not.) After surgery, another PT referred me to Claire after my shoulder stopped progressing and I suffered significant pain. She helped me get significant range of motion, strength back, and get rid of the pain. Claire worked with me both before and after my hip surgery. My doctor was impressed by her approach. I felt very prepared for the surgery and my recovery went very well." "After being injured with chronic hip pain for about 2 years and seeing multiple doctors and physical therapists, I had just about given up on the thought of ever being able to run-or walk without pain. 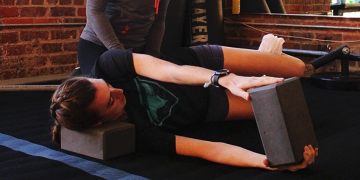 I heard about Abby and that she had been commonly referred to as, "The Running Specialist," and I knew that I simply had to set up an appointment and try one last time to find some answers. After one appointment, Abby's wealth of knowledge and positive attitude made me feel an immediate glimpse of hope. I consistently came back and did every rehab exercise that she prescribed to me with diligence. Over just a month later, I was able to begin running pain-free! I continue to see Abby every couple of months to gain her feedback and progression with my strength exercises and each time back I leave feeling encouraged and stronger. I now call Abby, "The Running Specialist," to anyone who is in need of improving their running form and decreasing their running-related injuries." "In one hour of video analysis and instruction Kari's advice had a significant impact on my efficiency in the water. But, more importantly, by using both her PT and swimming expertise, was able to pinpoint where my mechanics were causing shoulder injury, and provide corrections which do not further aggravate the injury. With her help, in one hour I took 10% off of my 50 time, and don't have a sore shoulder in the process! Thanks!" After battling a nagging Achilles injury that sidelined me for months I was referred to Abby from a few running friends. Training for a 4 day, 240 mile charity run I needed to get healthy….and fast. Immediately I knew Abby could help. What struck me most was the attentiveness that was given to every word. She hadn’t pre diagnosed me….Abby listened and asked questions. I remember walking out of her office the first time over a year ago and thinking, wow, I wish I had found her months before. Abby’s main concern is long term health and healing. Sure, after about 2 weeks of seeing her, I was back running 20 mile long runs again. Throughout my training I saw Abby more for maintenance issues due to 100 mile weeks. Throughout the rest of training I was healthy embarked on the charity run. If it wasn’t for Abby and her guidance including strength training I’m not sure I would have made the run. I’m also a running coach and refer all of my clients to Abby. Her seminars are incredible and very informative. I schedule seminars for my runners and Run Raleigh PT is always first on the list. Thank you Run Raleigh PT and Abby Douek for your time, care and consideration. 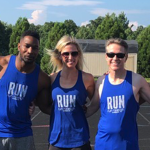 "Not only has Brian helped me quickly recover from a hamstring injury that was affecting my running, he also helped me understand what may be causing it. That has helped me not only prevent future injuries but also greatly improved my running." 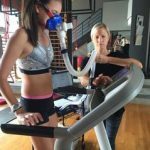 "Abby helped me become a flexible, fit and better runner by showing me my weaknesses and giving me the exercises to fix them...she introduced me to many great training techniques...I ran (2) 1/2 marathons and a full marathon under her tutelage...I recommend Abby without reservation." "I am writing to strongly recommend Kari as a Physical Therapist. In June I came to her with a frozen shoulder while healing a labral tear non surgically with Prolotherapy. It was immediately evident to me that she had the personal and professional expertise I was looking for. She is an amazing healer who has given me my life back. She has extensive knowledge of the body and how it works. Her therapy includes dry needling to release taut bands in muscles and decrease trigger point activity, followed by soft tissue work, joint mobilization and spinal mobilization. I wholeheartedly trust her when she performs this work on my neck, shoulder and back. She is gentle and caring however knows how far to take it in order to maximize the treatment. I always leave with strengthening and corrective exercises to do at home. Kari is a compassionate therapist with strong communication skills. I was frustrated and in pain. She was calm, positive and reassuring. She went out of her way to communicate with my Dr. in Chicago making sure everyone was on the same page with my treatment. She immediately responds to any questions or concerns I have. I could go on and on. My tear has healed and my shoulder improvement has been dramatic. Kari, “Thank You” for everything! I am so grateful to have found you."